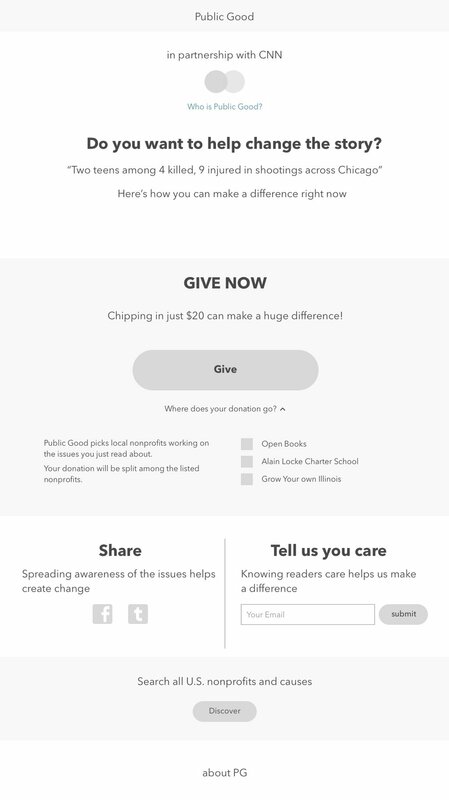 My former company Public Good's flagship product, "Take Action" buttons, are embedded in online articles to help connect readers with philanthropic actions they can take to support the causes they just read about. By revealing meaningful actions readers can take at the moments they are motivated, Public Good hopes to help readers make a difference in causes they care about and increase engagement for our media partners. My responsibility was to identity issues with the previous design, and come up with new design suggestions. When I started working on this project, Public Good had already placed "Take Action" buttons on some sites. When users clicked a "Take Action" button they were taken to a new page with a notice that they were about to go to Public Good Site. If they clicked OK, they would land on a page where suggested actions were shown. My job was to improve the overall experience for readers to complete the journey smoothly, and increase action completion rate. To address the issues we found through journey mapping, we decided our new landing page should: (1) reflect the connection between this page and the article they just read, (2) build trust towards Public Good, (3) clearly state how users can help. We decided to show the partnership between Public Good and the media site they were just on first, followed by the title of the article they just read. Then we listed three main actions to take: email opt-in, share on social media, and make donations. For the actions, we had two designs. V1 highlighted email opt-in, since it was the easiest thing readers could do to help, and psychology research suggests that it's more likely users will take a second action after their first. For V2, we highlighted donation action, since it was our most important business goal. For V2, we had three versions that revealed different amount of donation recipients' information. We wanted to run multiple variation testing on the live site to see which performed best. While I was at Public Good, we launched V1 ( "Give Now" as the prominent action). Unfortunately, I didn't get to see how this design performs compare to the previous design. But by closely working with some of the best product designers, I learned a lot about the value of looking at different approaches to solving one problem, and how to integrate live testing ideas to improve product performance.